We here at United Medevac Solutions are fortunate to work with many types of healthcare facilities and, therefore, many types of healthcare workers. When you think of healthcare, who are the first types of personnel that you think of? Doctors? Nurses? But, there are so many more types of healthcare careers that are helping patients feel better every day. Let’s take a look at some of them. Of course, there are too many healthcare career choices to list all of them here. But, we want to give you an idea of some of the careers that patients need (and facilities are staffing) so that you can begin to match your interests with your healthcare career path. For example, have you considered Respiratory Therapy? It is an exciting field with many areas for advancement and specialization. You give patients the care they need as well as working with physicians to complete a treatment plan. Do you enjoy eating healthy and creating healthy meal plans? Have you considered a career as a Dietician or Nutritionist? These clinicians are vital in helping the patient manage a disease, create and maintain a healthy lifestyle, reach healthy goals, and more. Upload Your Resume By Simply Clicking Here! Occupational Therapists have fascinating jobs. They help their patients recover and regain function with their daily activities. For example, after surgery, an OT may help the patient practice sitting on a shower bench, make a small meal by themselves, etc. Would you rather be a first responder? EMTs and Paramedics must be prepared to quickly respond to patients who need critical care. Often these healthcare workers are working in less than perfect conditions (out in the field, moving ambulance, etc). However, if this is your calling, it can absolutely be the most rewarding career. And, care doesn’t stop after the patient goes home. Home Health Aides are often needed after a patient leaves a facility. A career in home health can be very rewarding. Workers in this field often get to know their patients and their families well. They help those with a chronic illness, disabilities, and many times – the elderly. Simply Click Here To Submit A Service Request! These are just a few examples of the amazing careers available in healthcare today. We invite you to view a more extensive list from the Bureau of Labor Statistics. There are so many to choose from. We know you will find your perfect healthcare career! United Medevac Solutions provides staffing for healthcare facilities around the nation. We offer competitive pay and great benefits. We listen carefully to our client’s needs and then we match the correct healthcare personnel to their unique situation. If you are a healthcare provider/clinician and are interested in working with us, please upload your resume here. We would love to chat with you! Also, please don’t forget to check out our job board for our latest healthcare job listings. And, if you don’t find what you are looking for, please check back soon as we are always updating the list. Are you a facility in need of staffing? UMS is equipped and ready to provide your facility with the healthcare staffing that YOU need. Please give us a call at 888.632.5560 or simply complete a service request and we will begin staffing your facility appropriately. A career in healthcare is rewarding – no matter what job you pick. Patients rely on us to help them feel better, soothe their nerves, answer their questions, and give them a big smile. At the end of the day, we are exhausted…but we are usually the ones that have been given the big smile by our patients. 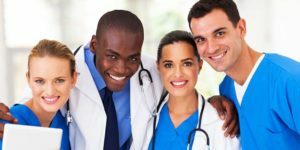 Was your healthcare career listed here? What job do you do to help your patients (either with direct care or administration)?